WOOOHOOOOO!!!! SUPER-HAPPY-EXCITED!!! This post marks that I am now half-way through the 50 artists posts for my Senior Seminar Summer Blog!!!! ^_^ <3 YAAAAAaaaaaaaaaaaaaaaaaaaaaAAAAYYY!!! William Kentridge. Walking Man. 2000. William Kentridge is an artist from Johannesburg, South Africa. He graduated from the University of Witwatersrand in 1976 and also studied mime and theater in Paris. 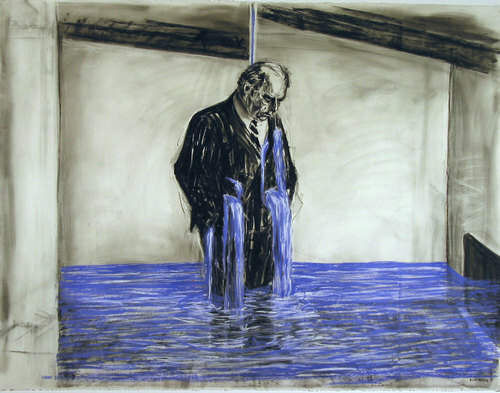 Kentridge uses a wide variety of media in his work, such as film/animation, drawing, sculpture and performance art. He has exhibited around the world. William Kentridge. Drawing from Stereoscope 1998–99. Charcoal, pastel, and colored pencil on paper, 47 1/4 x 63" (120 x 160 cm). Much of his work focuses on the dissolution of the apartheid in South Africa. William Kentridge uses poetic visuals that have a sobering effect on the viewer to the events and experiences that he lives in. I love his charcoal animation! He films in a stop-animation way that shows the charcoal being drawn, erased and drawn again to create the visual of motion. So I'll put a couple examples of that up here and also include a link to the video from Art21 that shows his more recent work and explains what he does better.